Ensuring an unbelievable wildlife experience, our Kenya & Tanzania Overland Adventure safari travels by 4 x 4, 7-seater Safari Cruiser to the best highlights of East Africa. A must for anyone who wants the widest experience of wildlife viewing in Africa. Explore the plains of East Africa on our Kenya & Tanzania Overland Adventure safari. Wildebeest, zebra and a host of other migratory wildlife await you in the amazing Serengeti – Mara ecosystem, stretching from Kenya’s Masai Mara in the north, south across great rivers, and into Tanzania’s great Serengeti plains. And, where the herds go, so do the predators… and you on our Kenya & Tanzania Overland Adventure. Covering a diverse number of locales, our Kenya & Tanzania Overland Adventure aims to showcase what these places have to offer. Starting in Nairobi, Kenya, we travel to the Mount Kenya region. Mount Kenya, an extinct volcano, is the highest mountain in Kenya, with its highest peak topping off at 17,057 feet and the second-highest in Africa, after Kilimanjaro. Wildlife in the Mount Kenya National Park include elephants, tree hyrax, white tailed mongoose, suni, black fronted duiker, mole rat, bushbucks, water buck and elands; over 130 bird species have also been recorded. 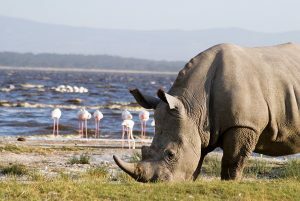 Next, it’s off to Lake Nakuru National Park and Lake Naivasha on the floor of the Great Rift Valley surrounded by wooded and bushy grasslands. Crowds of flamingos famously line these lakes’ shores and are often joined by other larger wildlife, attracted to the cooling breezes of the lakes. Next up, decamp and continue on to the world famous Masai Mara, home to the Maasai people and the Big Five game; be ready for some truly incredible game drives. After this, it’s on to Amboseli National Park for more fantastic, up-close game viewing and thence it’s off to Tanzania. Our first stop in Tanzania is Lake Manyara National Park, located beneath the cliffs of the Manyara Escarpment, on the edge of the Rift Valley, Lake Manyara National Park offers varied ecosystems, incredible bird life, and breathtaking views. 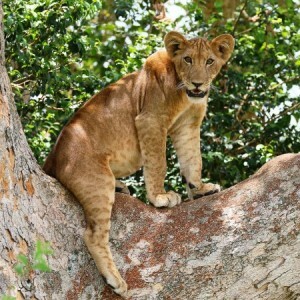 Lake Manyara’s famous tree-climbing lions are another reason to pay a visit to this park. The only kind of their species in the world, they make the ancient mahogany and elegant acacias their home during the rainy season, and are a well-known but rather rare feature of the northern park. In addition to the lions, Lake Manyara National Park is also home to the largest concentration of baboons anywhere in the world — a fact that accounts for interesting game viewing of large families of these primates. Next up, enjoy a true “Out of Africa” experience on the plains of the Serengeti. The fabled Serengeti National Park is undoubtedly the best-known wildlife sanctuary in the world, unequaled for its natural beauty and scientific value, it has the greatest concentration of plains game, wildebeest and zebra, in Africa. The resident population of lion, cheetah, elephant, giraffe, and birds is also impressive. Continuing your experience, see the densest concentration of wildlife in Africa at Ngorongoro Crater, and enjoy a descent into the largest intact volcanic caldera in the world and home to the densest concentration of wildlife in Africa for wildlife viewing and a picnic lunch. Complete your Kenya & Tanzania Overland Adventure as you depart for Arusha and thence onward to Kilimanjaro International Airport for your flight home. On arrival at the Nairobi Jomo Kenyatta International Airport you will be met by a representative of Great Safaris and transferred to the Southern Sun Mayfair Hotel. Breakfast at the lodge. Drive to Arusha and onward to Kilimanjaro International Airport to commence your departure flight.